If you regularly watch the night sky, you might sometimes notice a slowly moving light, dim at first but gradually brightening before fading into darkness again. They’re known as iridium flares or satellite flares, and they’re caused by sunlight reflecting off of satellites. They’re sometimes confused with shooting stars by inexperienced sky watchers, but they are easily distinguished by their slow motion across the sky, as seen in the video above. 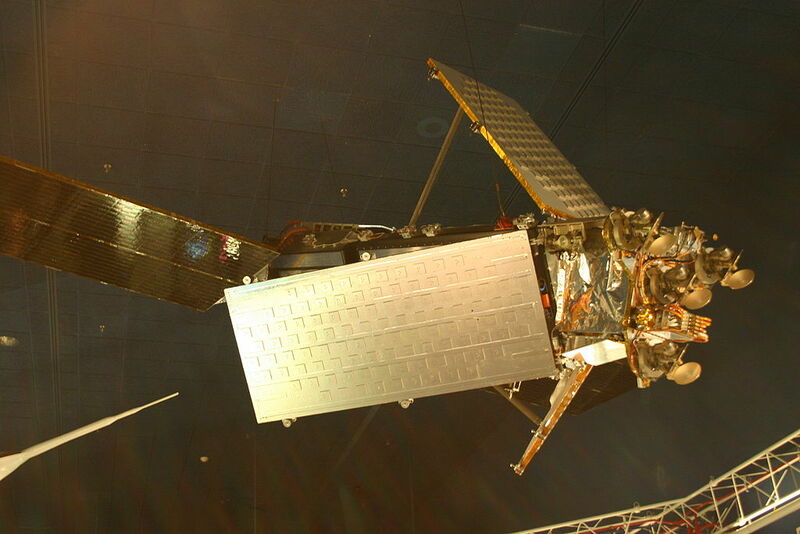 Replica of an Iridium satellite. They are known as iridium flares because often they are reflections from an Iridium communication satellite. There are 66 of them orbiting the Earth, and they each have three large communication panels. These panels make for bright reflections when aligned in the right way. Other satellites can create similar reflections, but often aren’t as bright. Since the trajectories and orientations of the iridium satellites are known, you can predict when and where an iridium flare will appear. For example, the Heavens Above website can give you a list of what’s visible at your location, including iridium flares. Typically there will be at least one every few days. Over the next several years iridium flares will likely become more rare. Iridium plans to start launching a new generation of satellites known as Iridium NEXT, and the older satellites will be de-orbited as they are replaced. The new satellites don’t have the large bright communication panels, so their reflections won’t be as striking. “Iridium plans to start launching a new generation of satellites…” You mean NASA? No, I mean it in the sense of “I plan on flying to Atlanta next week.” when I’m not the one flying the plane.